To help protect the San Diego area from wildfires, San Diego Gas & Electric announced a $100,000 grant that will allow local emergency-services providers to purchase an array of essential equipment. SAN DIEGO (CNS) - To help protect the San Diego area from wildfires, San Diego Gas & Electric announced a $100,000 grant that will allow local emergency-services providers to purchase an array of essential equipment. "By collaborating with fire agencies to help provide critical equipment they need and continuing to improve our electric system, we are making our region more prepared today than it was yesterday," said Dave Geier, the utility's senior vice president of electric operations. The six-figure award will allow the San Diego County Fire Authority and firefighting agencies in Alpine, Julian and Borrego Springs to obtain new state-of-the-art equipment, including upgraded maps and radios, self-contained breathing units, medical equipment, and mobile computers on fire engines, and will also pay for additional education and outreach on defensible space and other vital fire protections, according to SDG&E. 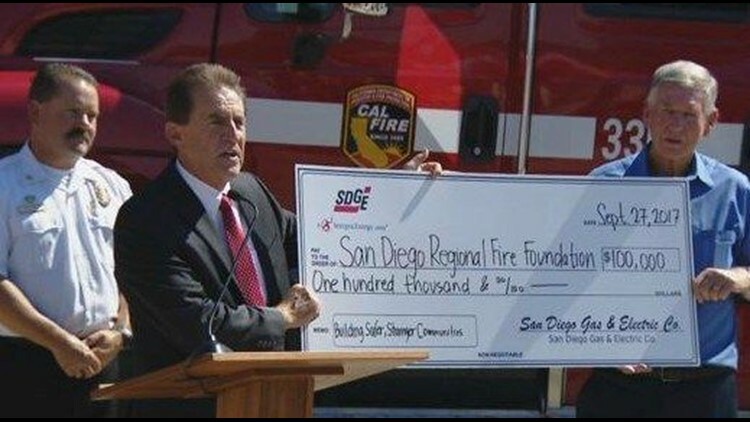 To date, the utility has donated nearly $1 million worth of shareholder funds through its "SAFE San Diego" initiative, a program that benefits fire agencies, fire-safe councils, community emergency-response teams and other organizations that educate the public about fire prevention, encourage emergency preparedness, and carry out response and recovery efforts. "In San Diego County, we live with the year-round threat of wildfires, so these donations are instrumental to our brothers and sisters who respond to (emergency) calls every day," county Fire Chief Tony Mecham said. "We know that collaborations like this are truly making an impact when we can measurably reduce response times and fire damage to private properties."